During the phase when international teams come to explore the Moon, there would also be cargo missions that would deliver more inflatable habitats. A 20 metric ton payload could deliver an inflatable skin with a surface footprint of about 2.3 acres. Later deliveries could deliver portions of the Kevlar restraint layer, and the other inner layers necessary. The point is that, during the base expansion phase, very large structures could be set up. Individual, large habitats could be dedicated to certain infrastructure services such as life support production, sanitation, manufacturing, chemistry, farming, a larger centrifuge, recreational areas, dining hall, and clinic. During the international lunar exploration phase, perhaps countries will want to bring some of their explorers back but leave others behind in a growing, developing international settlement. With the increasingly high flight rate and economies of scale, the participating companies would be able to sell transportation and habitation to wealthy private individuals who would like to be part of history -- being part of the first branch of humanity off Earth. These early settlers would need to have lived a long enough time to save up enough money. They would also likely need to be free from career and childrearing responsibilities. In other words, retirees would likely make up much of this early group of settlers. The same process of establishing a settlement on the Moon would be repeated on Mars and perhaps elsewhere. What would it be like to quality of life that retirees would desire? This would need to include the appropriate medical care at each level of development. For some period of time, inflatable areas could be shipped to the Moon would be a faster, more cost-effective solution than it would take to develop large-scale construction processes using local materials. But eventually, construction from local resources will become the standard at which point items shipped from Earth will be limited to low-mass, high-value items that cannot easily be produced on the Moon. By that time we will probably have fairly sophisticated, intelligent machines that will do most of the construction with limited oversight. 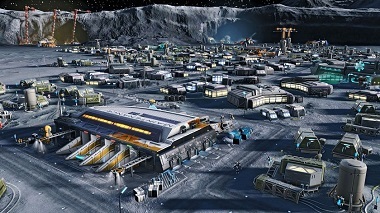 Many space advocates ponder about how space settlement could pay for itself. What material will be worth so much that it could be shipped to Earth for a profit? If the materials will be used in space, what's the financial reason that people would want to go in the first place? Many historic analogies suggest one thing or another. The Plan proposes that the answer to this question is fairly straight forward. We see that the first people who could afford to go are those who have been able to save up enough money to be able to pay to go. They are not necessarily going to make a lot of money but to spend the money that they have saved. Active retirement communities don't mine ore, nor manufacture anything, nor invent, yet they grow over time. How is this possible? It's because the residents are done making money and now they want to spend their savings. And for those early settlers, it is making one's life significant by participating in one of humanity's most historically significant steps. This intangible but very real and strong motivation will be what will fund the development. Increased physical mobility could also be a significant reason for retirees to move to the Moon. But there's another key point. Finding ways to reduce the cost of settling off Earth will be more important than figuring out what material resource will pay for settlement. Lowering the cost of launch, harvesting water for propellant and consumption, producing metals and manufacturing items, and recycling will reduce the transportation costs to the point where what's being shipped is largely people and electronics -- not that much mass. At that point, closing business cases becomes a lot easier because profit isn't just about income but about reducing expenses as well and there's a lot of room to do the latter. Eventually we want settlement to be on the scale of a million or more. Is such a scenario limited only to science fiction or is there a path which could use near-term capabilities?